Let mail.com MailCheck continuously notify you about new e-mails. You will also have immediate access to the mailbox. 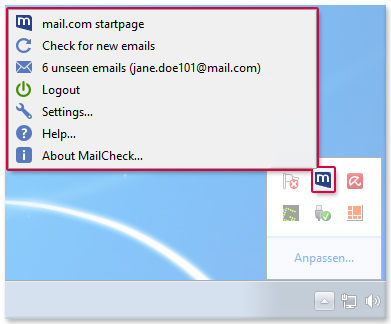 After installation, mail.com MailCheck will appear on Internet Explorer's toolbar by default. The number next to Inbox will tell you about new e-mails. You can open the drop-down menu by clicking the arrow (to the right of Inbox). From there, you can manually check your mailbox for new e-mails, open your mailbox, write an e-mail, open Contacts or write SMS or MMS. (1) mail.com Use this button to access the mail.com home page. (2) Search Bar Enter the keywords for a search or double-click a word to paste it to the Search Bar. (3) mail.com Products Use these buttons to access other mail.com products. (4) Settings Use the wrench icon to access the Settings dialog. You can also use MailCheck from the task bar icon. The number next to the task bar icon will tell you about new e-mails. If you right-click the icon, a context menu will open. 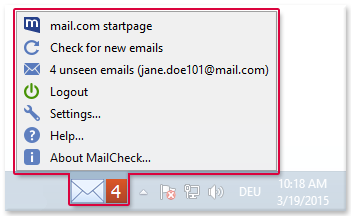 From this context menu, you can switch to your mailbox, for example, log out of MailCheck or open the Settings dialog. Instead of the task bar icon, you can use MailCheck from the information area icon. You will find the information area to the right of the task bar. Right-clicking the icon opens a context menu. From the context menu, you can access several features as with the task bar icon.